Xhale Assurance’s nasal alar sensor offers exceptional clinical capabilities and strengthens our patient monitoring offering with a next-generation pulse oximetry sensor technology. -Felix Baader, Business Leader of Monitoring & Analytics at Philips. Xhale Assurance’s innovative alar sensor allows accurate measurement at lower oxygen saturation levels, which is essential for patients who have suffered a heart attack or a hypoxic event. 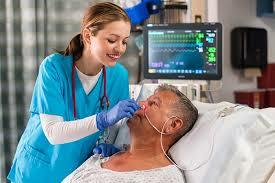 As such, the sensor enhances patient safety by overcoming the shortcomings of existing oxygen saturation sensors, and can provide caregivers with early warning signals of impending adverse events. Philips’ industry-leading patient monitoring portfolio addresses all acuity levels and care settings within hospitals and health systems, and supports a broad patient population – from basic screening to complex surveillance in critical care. It includes bedside and wearable patient monitors, consumables such as connected wearable biosensors, and clinical decision support tools and mobile applications for real-time clinical information at the patient’s bedside. More than 275 million patients are monitored each year with Philips’ patient monitoring solutions.